Taste test: These conventionally cooked potato chips were thick cut and very, very crunchy. About as crunchy as a non-kettle-cooked potato chip can get. They had a toasted onion taste with a little bit of cheese to it, and they were pretty good. Smell test: Decent oniony smell. 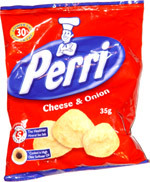 This snack was discovered by Judy in Ireland. Review published .